This is the area behind the commercial blocks on the north side of upper Main Street in Amherst where Bueno Y Sano is now located. The College Candy Kitchen was located in the Nash Block before the fire in February of 1928 destroyed the building. 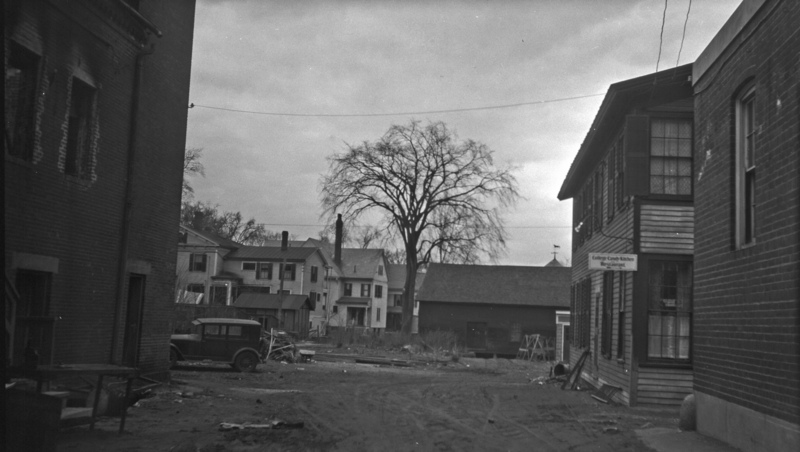 The Candy Kitchen temporarily operated out of Carpenter's Hall, (middle building on right) as shown in this photograph. This area was part of the property owned by Noah Webster from 1812 to 1822. Boltwood Walk and the Boltwood Walk Parking Garage now occupy this area. Barnes, Lincoln W., 1879-1966, “College Candy Kitchen in Carpenter's Hall,” Digital Amherst, accessed April 21, 2019, http://digitalamherst.org/items/show/920.